Can corporate finance save the Co-op? The scandal-hit UK mutual’s “root and branch” review is examining all options. Co-op’s incompetence means its unwieldy roster of businesses deserves to be broken up. Yet a poison pill and justifiable affection for its model means owner-members will stomach less radical surgery. 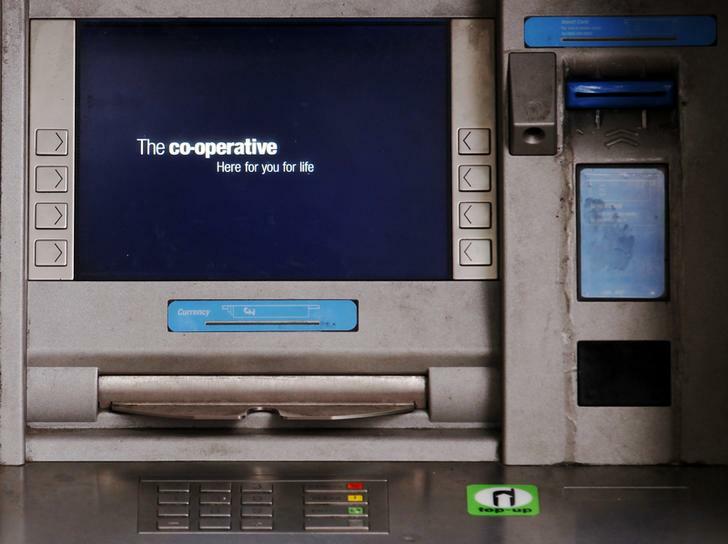 A cash machine for the Co-operative Bank is pictured with the message "Here for your life" in London October 21, 2013. The independent investigation into the near-collapse of the Co-operative Bank must find out how disgraced former Chair Paul Flowers was allowed to hold his position, UK Prime Minister David Cameron said on Nov. 20. Flowers, a Methodist preacher with little banking experience, oversaw the bank’s near-collapse and has been caught on film allegedly arranging to buy illegal drugs. Flowers left the Co-op in June after three years as chairman when the bank brought in new management to oversee a restructuring and deal with a 1.5 billion pound capital shortfall. The Co-op set up an independent review in July into the events that led to a 1.5 billion pound capital shortfall at Co-op Bank. The review is chaired by former civil servant Christopher Kelly and will report back in May. British police searched Flowers’ home in Bradford, Reuters reported on Nov. 20. Co-op Group Chairman Len Wardle said on Nov. 19 he was resigning with immediate effect. Wardle had intended to stay until May.